On the First Friday of every month, thousands of residents and visitors fill the sidewalks of the Crossroads, enjoying what has become the city’s liveliest and most popular recurring event. 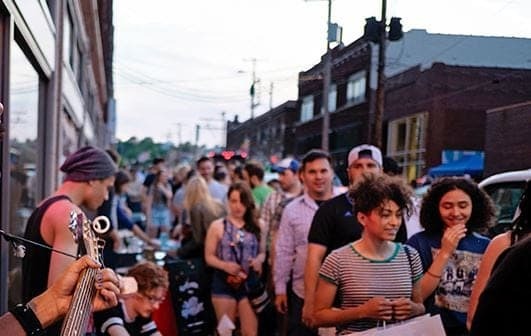 Arts organizations, galleries, studios, and a wide variety of local businesses feature local, regional and national artists as well as live entertainment from 5 to 9 p.m. Take the free KC Streetcar and avoid the parking hassle! Don’t forget KCLoftCentral has several buildings located in Downtown Kansas City’s Crossroads neighborhood. Stop by our leasing offices at 2121 Central or 1601 Walnut to take a tour of Stuart Hall, EBT, or Crossroads Lofts. You can also call us at 816-842-6544 to learn about our current specials and availability.